Long runs in the Snakes and the Roots. I finished out my week with two long runs with very different characters. Cumulative weekly stats: 90 miles, 22hrs, 25000′ of gain. Morning cruise to the top of Stuart Peak and back. This trail is really perfect for moving quickly. 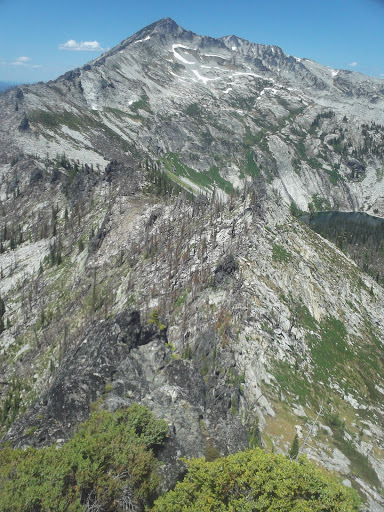 There are no rocks, the grade is pretty uniform, minimal deadfall, and no views before the summit. I used the descent to work on maintaining a sustained fast pace, averaging between 6 and 7 minute miles, which is really fast for me, and felt surprising good at the end. Unnamed peaks in the Lochsa’s headwaters. Deadfall here was managable until the 6000′ level, where both the deadfall and the overgrowth of the Idaho jungle into the trail made things slightly difficult. I was expecting the trail up Packbox Creek to be better, since it is ostensibly the more popular point of access between Montana and Idaho. I came to learn that this is not the case, and that neither trail has been cleared in a number of years. Packbox Creek’s trail was very difficult. Whatever drainage structures existed have become useless, and the amount of brush encroaching on the trail made running impossible. I felt like I was walking through a creek bed, but it wasn’t possible to say for certain because I couldn’t see my feet. In many places, the trail was incised two feet. Additionally, there were more than fifty trees over the trail. Alas, I eventually made it above the brush line and resolved to run the remaining 1000′ of steepish vertical up to Packbox Pass, simply because I had not been able to at all down lower. 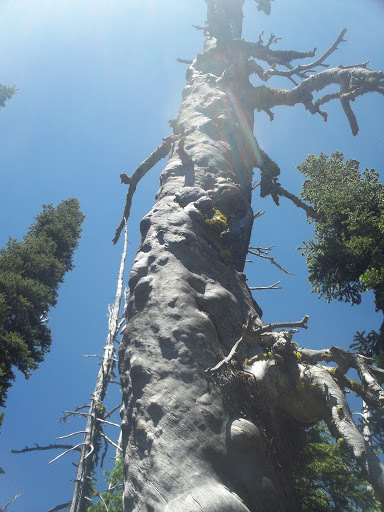 Neat tree on Packbox pass. This was the worst section of the trail for deadfall, in some places stacked 10 feet high, with thick brush precluding going around. I would guess another fifty trees need cutting in this 1 or 2 mile long stretch. 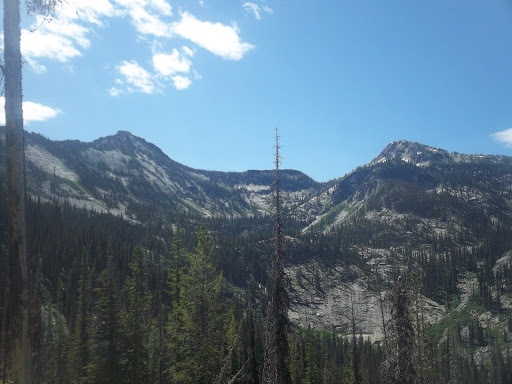 I ran into an old time Bitterroot horseman camped on Big Creek Lake, and we had a good discussion about trail maintenance and federal funding for trail maintenance. 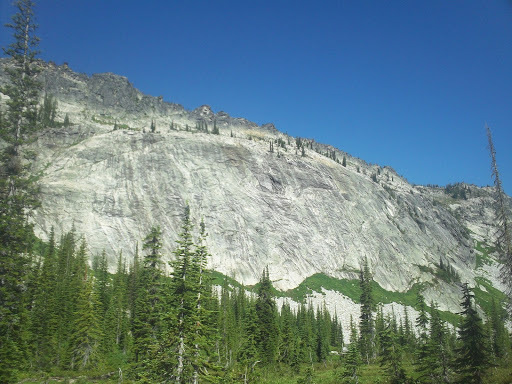 We agreed that the route I had just taken should be a priority for trail work, for a few reasons: First, all the trails are stock-suitable (were they maintained properly), and having this clear would provide an excellent loop for horsepackers and backpackers. This is some of the most scenic country in the Bitterroot, after all. 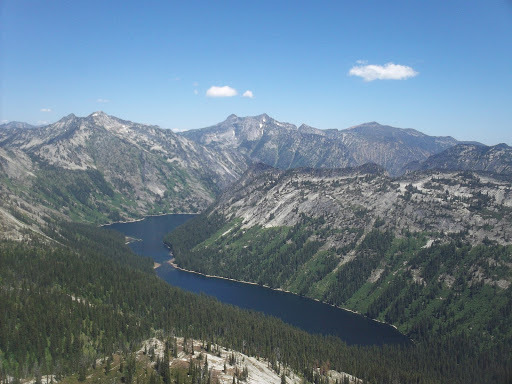 Second, clearing this loop would provide two great access points into the Idaho side, which would expand possibilities for outfitters and recreationalists alike, especially since the trails down towards the Colt Killed trailheads do get maintained. Finally, the amount of work necessary to get these trails in working order, though non-trivial, would not be prohibitive. An MCC crew could get it done in a hitch or two, by my estimation, and according to Jim it would be easy to get pack support from the Montana Backcountry Horsemen. The rock work is excellent because these trails were built long ago by people who wanted them to last. There’s plenty of good tread and good structures; if the trails don’t get fixed up soon, these may be lost to vegetation. The last ten miles to the Big Creek trailhead were rather slow and painful. Fatigue had overtaken me quite suddenly upon reaching the dam at the bottom of Big Creek, and the trail was rocky and technical much of the time. My knees were really feeling the constant gait changes. At the TH I was happy to see that no one had stolen or vandalized my bike. The ride back to the truck was deliberately slow, taking over an hour to make the 13 miles over both washboarded dirt roads, loose gravel (grr. ), and nice pavement, for a total of 44 miles worth of human-powered propulsion for the day. Previous PostOfficial training.Next PostRunning race courses and continued gendarmigans.